Reggie Turner: [Holding up a framed picture of Queen Victoria] No exiled fairy's trousseau is complete without a signed portrait of the great widow herself. You must dance naked before it at the Jubilee next month. 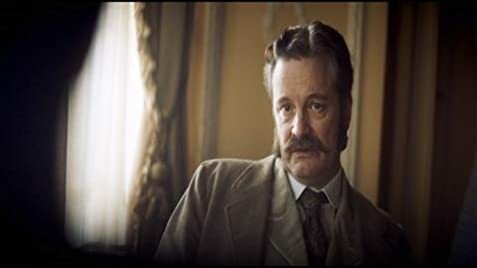 Rupert Everett fulfils a long-held ambition here to make a film about the last days of Oscar Wilde, and in the title role he is simply terrific - he is never off the screen. To write it and direct it as well, however, is to take on too much; indeed the need for an objective view is often apparent when it comes to narrative and structure. The film starts slowly (with a dreadful cardboard cut-out of London by night that could have taken from Olivier's wartime Henry V) and it's some time before the flashbacks (and flashbacks within flashbacks) begin. 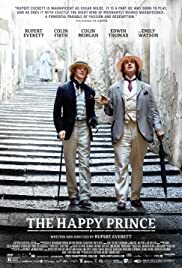 Supporting performances, especially from Colin Morgan as Bosie and Emily Watson (under-used) as Constance, are excellent and the photography,(particularly in the Italian sequences) beautiful, though I found the half-shadows of the faces in the candlelight rather tiresome. I must add that, for someone who is penniless and constantly on the run, Wilde does possess a large wardrobe. There is more humour than one might expect (I won't spoil your enjoyment by quoting any of the jokes but I found the sequence where the priest (Tom Wilkinson) comes to give Wilde the extreme unction especially hilarious). Great attention is paid to the soundtrack, but why the use of Tchaikovsky's Pathetique Symphony at the end? All in all a fine effort, but I did leave the cinema strangely unmoved. 10 of 23 people found this review helpful. Was this review helpful to you?